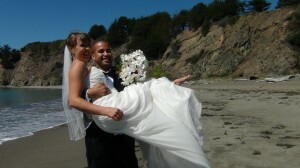 Watch this lighthearted look at their special day mixed to one of the all time great songs by Etta James, “At Last”. Sequoia and Larry eloped to the Elk Cove Inn. A wondrous day for a wedding, we couldn’t have asked for better weather. Congratulations Larry and Sequoia! May you be blessed with a long and happy marriage.